Take care of your spiritual cleansing right at bath time with this chakra soap set. Each of the goat's milk soaps corresponds to one of the seven energy centers found in the body. Breathe in the calming scent of lavender to open up your crown chakra and achieve peace of mind, or soothe your solar plexus chakra with an enticing blend of frankincense and myrrh. According to Sanskrit belief, keeping the chakras clear has a host of individual and collective benefits. Work through all seven energy centers in a week for what's bound to become a beloved daily ritual. Handmade in Missouri. Feel like a king with lavender soothing your crown by opening knowledge, aspirations, and peace of mind. Close your eyes with rosemary to focus the third eye on self-realization, intuition, and release. Clear your throat with eucalyptus to balance relationships, expression, and belief. Pour your heart out with peppermint while discovering harmony in love, forgiveness, compassion, and self-acceptance. Become a ray of sunshine with frankincense and myrrh by unlocking intellect, humor, and self-confidence. Channel your inner siren with sandalwood. Responsible for emotions, sensuality, and intimacy. Plant a root of security and self-preservation to ground yourself in positive energy. 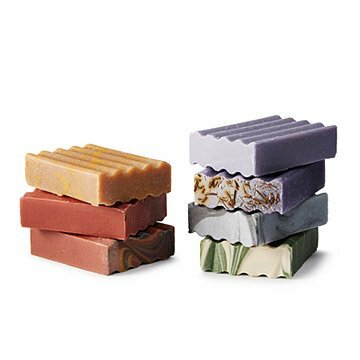 Ingredients: Saponified 100% food-grade olive, coconut, palm, and castor oils, in a goat's milk base, pure essential oils, and mineral pigments. Gave as a gift and was loved. Added cost for gift box was a waste. Thin cardboard was inadequate for the relatively heavy bars of soap. It arrived crinkled and mashed. Find a decent box and wrap the soaps yourself. Individually, this soap is great. Several bars in a cardboard gift box shipped with other unrelated items = overwhelming smell. Everything else packaged in the box (including a scarf wrapped in plastic) still smells quite strong, even after airing out for 2 weeks. Will have to return the items just because of the odor. I bought this for my mom, and she loved the smells, the descriptions that came with the soaps, and the soothing texture.